Early last week, we took to the seas (and land!) again for our February 4th Blue‘Aina trip, hosting the non-profit organization Oceanwide Science Institute, and sponsored by one of our repeat favorites, Aloha Kayaks Maui. Founded in 2012, our generous sponsor, Aloha Kayaks Maui, is a sustainable tourism business based out of Makena and Olowalu that offers kayak, snorkel, paddleboard and whale watch tours. Aloha Kayaks is focused on providing guests with unforgettable experiences, interlaced with ecological background, Hawaiian culture, and education about Maui’s lush, abounding sea life. Their mission: protect our oceans (!) by providing eco-friendly adventures for Maui’s many visitors, and even reusable water bottles during their tours! As a member of the Hawai’i Ecotourism Association, Aloha Kayaks was excited to return as a Blue’Aina sponsor for Oceanwide Science Instititue (OSI). Starting the day off in Lahaina Harbor, our 60 eager volunteers conducted a land-based trash cleanup. 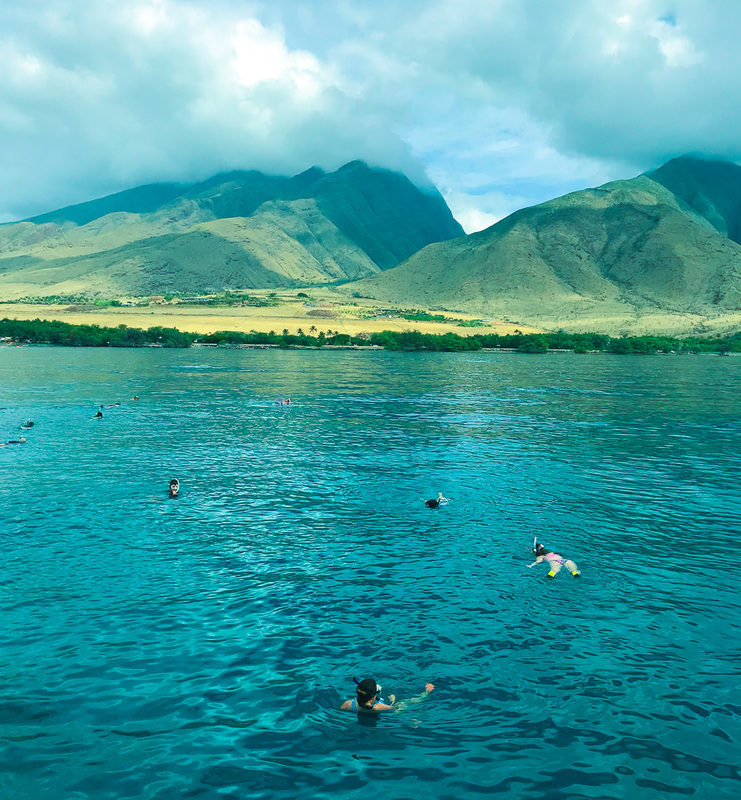 We then loaded up Trilogy VI and made our way to Olowalu Reef, known for being Maui’s mother reef and boasting over 1,000 acres of coral (whoa)! Right in the thick of humpback whale season here on Maui, we didn't make it far before some active humpbacks decided to put on a show for us. After a brief break to take in the majesty of these beauties, we waved goodbye and travelled on to our reef cleanup destination, Olowalu. During our snorkel cleanup, our guests kept their eyes peeled for any type of foreign contaminants in the water – check out Sydney’s find! Geared up and ready to go, we began our reef dive with an introduction from OSI Research Specialist, Eden. Like Blue’Aina, OSI’s work is supported through private grants and contracts with government agencies, in addition to generous private donor contributions, and all united through the same passion for conservation. Founded in 1998 on Oahu and now with an auxiliary office in Maui, OSI is comprised of a group of academics and professionals seeking to further the understanding of the marine ecosystem through science and education. Among the many facets of their work, a common thread in their line of efforts is the use of sound to study biological, ecological and anthropogenic processes in the marine environment. They are involved in both local and global marine science and conservation efforts, and exemplify our own mission here at Blue’Aina. On board the catamaran, guests could take a quick rest, enjoying snacks provided by Trilogy, and some pretty stellar equipment that OSI brought along. At the listening station, our volunteers were able to hear the haunting and beautiful underwater noises from our marine life friends. In addition to the listening station, OSI also brought along an Ecological Acoustic Recorder (EAR) - a low power acoustic recording system designed for long-term monitoring of natural and anthropogenic sounds in aquatic habitats. After a fun and educational day, we sailed the Maui winds back to Lahaina Harbor, where we bid our volunteers farewell. Another Blue’Aina in the books – helping to keep Maui’s land and ocean untarnished, one event at a time. Trilogy’s next Blue‘Aina is on March 4th and we are sold out – mahalo already to our anxious volunteers! Head over to our website for the next available trip and most up-to-date details. What Do the Trilogy Flags Mean?